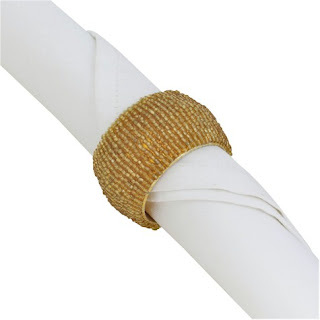 Amazon has got a fantastic deal on these gold beaded napkin rings, priced at $8.99 with free Prime/SuperSaver shipping for a set of 6: buy three sets and the fourth set is FREE. No promo code needed, just add four sets to your shopping cart and the price of the fourth one will drop off. 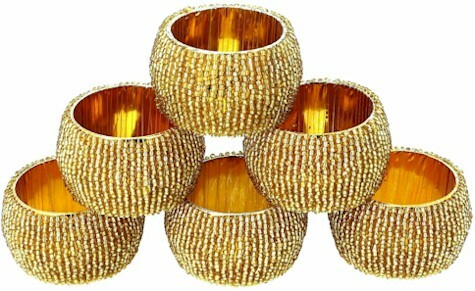 That's 24 gold beaded napkin rings for $26.97, or $1.12 per napkin ring! (Beats BB&B price by about 100%!) These napkin rings got 4.4 out of 5 stars over 69 customer reviews. Please note that in order to get the buy-3-get-the-4th-free deal, the vendor should be "ShalinIndia," and the price should be $8.99. These napkin rings go with a lot of different table decors, but if you've got gold-rimmed china, these are especially pretty, and they'll make your table settings "pop." If you have silver-rimmed or platinum-rimmed china, you can get the same deal on these silver napkin rings. If you don't need this many, consider putting one set away for Pesach, or teaming up with a friend. I bought the 24, because my napkin rings tend to disappear (friends' kids think they are toys and take them home, etc. ).